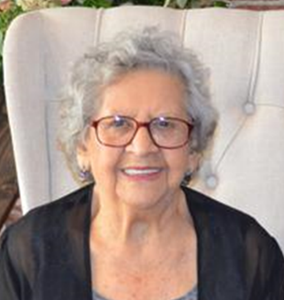 Rosario M. Fresquez was born October 7, 1923 to Manuel Matamoros Duran and Maria Peters Cervantes Aguilar in a small city near the Basilica of Virgin Guadalupe which is near Mexico City. Her given name is Maria del Rosario Victoria Matamoros. As a young teenage girl, she lost both parents and was forced to stop her education to help raise her eight siblings. After her brothers and sister were educated and had found employment, she married Rodolfo Aurelio Ruiz Contreras. They had two children, Lupe and Rudy. In 1955 she along with her two kids moved to Roswell, New Mexico to start a new life. While living there she met a rancher/Deputy Marshall, Dave Fresquez. When Lupe decided to go to University of New Mexico, she moved the three of them to Albuquerque. She didn’t want anyone to come between her and her children so refused Dave’s proposals of marriage. After she knew that both of her children were married and on their own she agreed to marry Dave who now was living in Albuquerque and was the US Marshall for the state of New Mexico. In our eyes we would say that Rosario had a hard life—a young widow, 8th grade education, no work training, not speaking English, and a son badly injured and hospitalized for 16 months-- but she made the best of it and persevered to the amazement of all who knew her. She worked hard to achieve a life so that both of her children would go to college and become honorable, productive and God-loving people. She became a men’s tailor and worked at several exclusive men’s clothing shops in Albuquerque, NM, Wichita, KS and Marion, IN. She was loved by all she met and her family in the states as well as from Mexico and Europe. She set the bar high for all of us to follow. Rosario was preceded in death by her husband Dave Fresquez; daughter Lupe Browne, and all her brothers and sister. She leaves her son and daughter-in-law, Rudy and Roberta Ruiz of Overland Park, KS. Five grandchildren, Kristin Sneegas of Merriam, KS; Nate Ruiz of Wichita, KS; Jim Browne, Gabriel Browne and Sofia Cento all of Indianapolis, IN. In addition there are 8 great-grandchildren, several nieces and nephews living in the states as well as Mexico. We feel the sadness of her passing but we also feel awe at what this special lady was able to accomplish and how she touched the lives of so many. Lord, thank you for allowing us the privilege to be part of her life.